February 10th sees the arrival of The Year of the Snake. 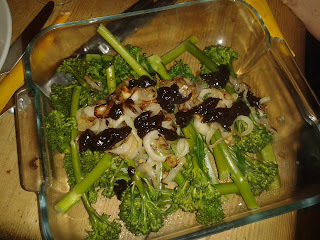 With this in mind, the theme for this month's supper club was easy. 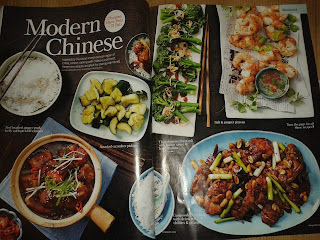 I took this modern Chinese menu straight from February's Good Food, with recipes by Jennifer Joyce. A quick stop off at Loon Fung Supermarker on Gerrard Street in Soho, and I had everything I needed, including a couple of dragon hand-puppets for the kids. I served the whole meal as a buffet. 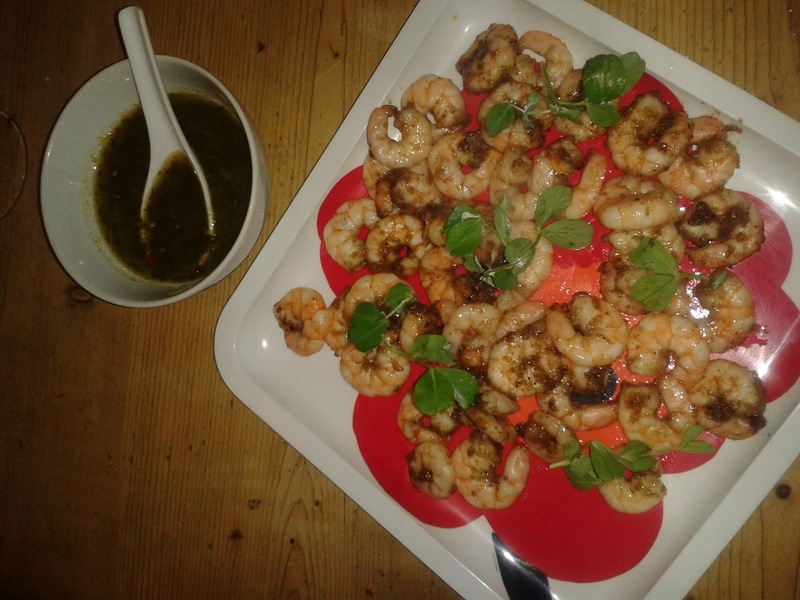 These prawns were tossed in finely ground Sichuan peppercorns, sea salt, black pepper and chilli flakes, mixed with a little cornflour and stir-fried briefly. 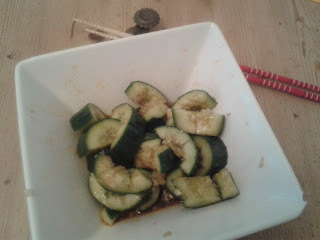 The dipping sauce was absolutely delicious, made with crushed garlic, coriander, and chilli, with caster sugar dissolved in, and then mixed with lime juice and fish sauce. Served with pea shoots. Surprisingly simple, the cucumbers were smacked and chopped, and pickled with some finely chopped garlic, caster sugar, light soy sauce, Chinese black vinegar, rice wine, and chilli oil. The broccoli was blanched for about 5 minutes, then tossed in shallow-fried shallots and garlic, and drizzled with hoisin sauce. A beautifully authentic dish, the chicken thighs were marinated overnight in soy sauce, then seared in a pan. 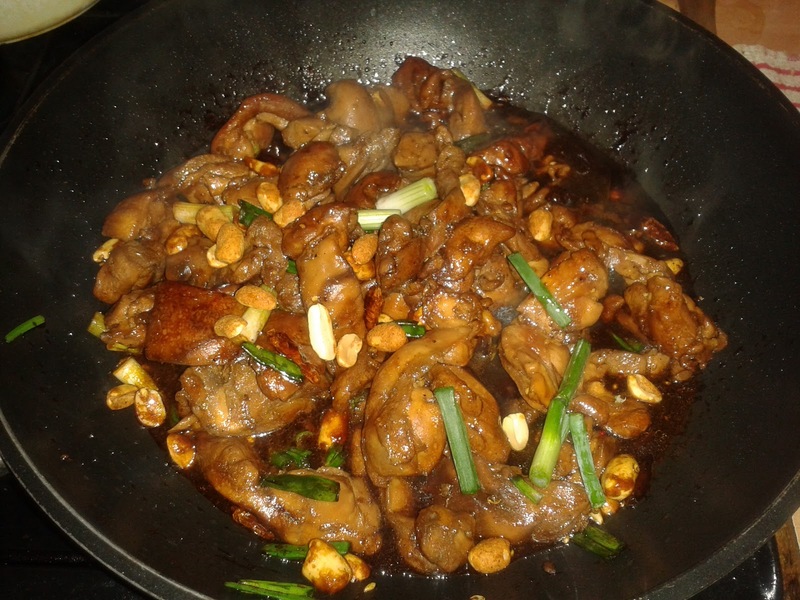 Then fried off 15 whole dried chillies, then with Sichuan peppercorns, spring onions and peanuts. 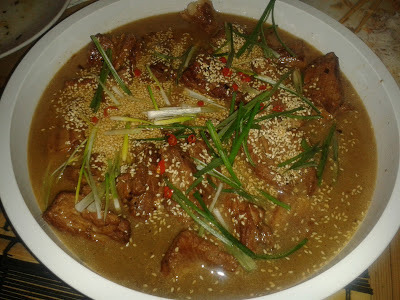 A soy, rice wine, black vinegar, chicken stock, caster sugar and cornflour sauce was then stirred in unti the chicken was cooked and the sauce thickened. Of the 15 chillies, three were quite explosive around the dinner table! The star of the show - the hardest part of this dish was removing the pork belly rind, but it was well worth it, as the overnight marination in soy sauce and rice wine ensured a tender and delicious meat, when cooked in garlic, ginger and chilli, in a sauce of black vinegar, rice wine, sugar and stock for several hours, then scattered with toasted sesame seed, spring onions and sliced chillies picked in rice wine vinegar. Delicious! This recipe by Ching He Huang was more of a experiment than the rest of the menu. I've never made dough with rice flour before, but it was fun - especially trying to stuff the chocolate inside! I thought it was a little dry and indeed once the balls were cooked, they were indeed a bit chewy, so next time I would make them with more water. Perhaps the flour wasn't glutinous enough. 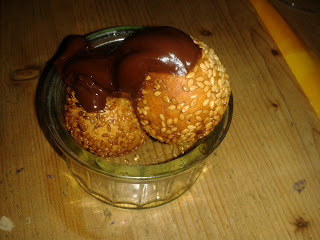 The chocolate sauce was scrummy though. 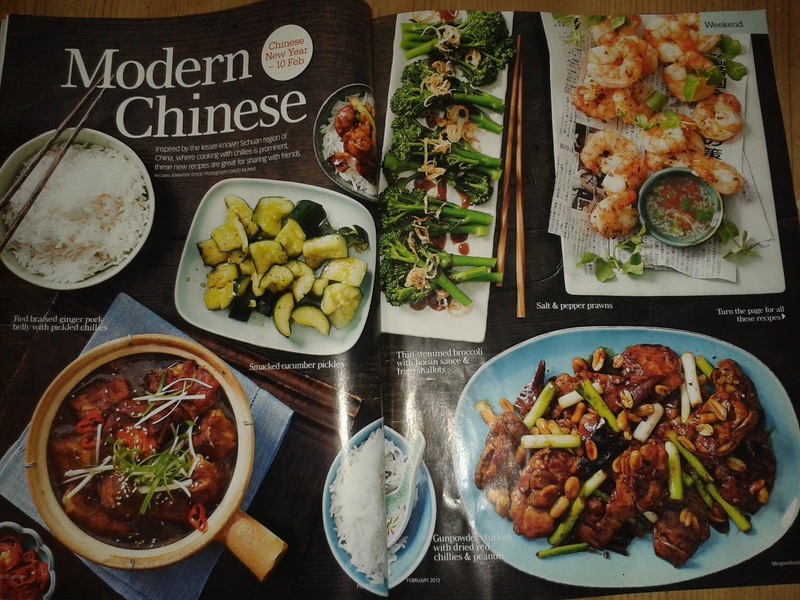 Modern Chinese recipes were written by Jennifer Joyce and published in February's Good Food Magazine. Photograph by David Munns. 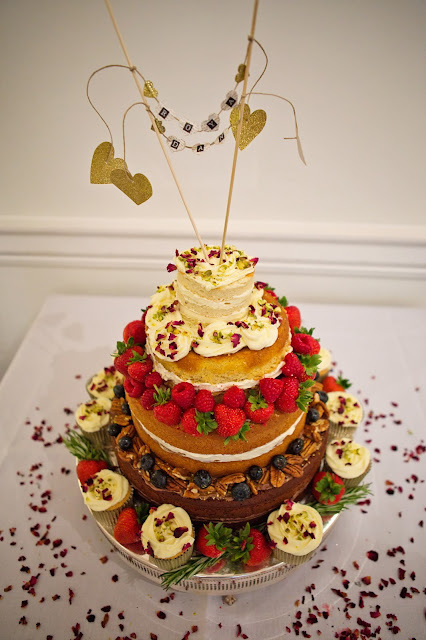 Food Styling by Jennifer Joyce. Chocolate Sesame Balls recipe by Ching He Huang.